At Carson City, June 9, 1937. Ted Wurm photograph. The gas powered motorcar that became Tonopah & Goldfield, and later Virginia & Truckee No. 99 was one of many built for different railroads on White truck chassis by various coach body builders around the country, including several in San Francisco and Sacramento, California. The 22 seat body for No. 99 was built on a 2 ton White chassis by the San Francisco firm of Thomson-Graf-Elder in 1921 for the Tonopah & Goldfield. The T&G had purchased the car for service during the Divide boom, which did not last. In 1926, the T&G offered the little-used motorcar for sale. 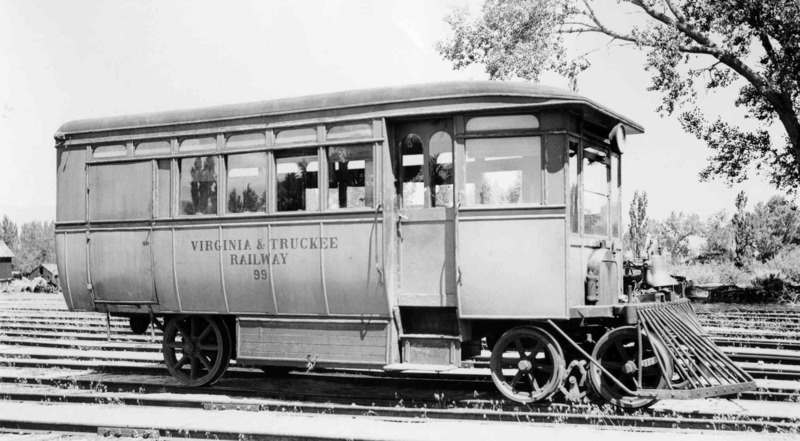 The Virginia & Truckee was looking for a new car to supplement their No. 23, a car built in 1917 by Thomson-Graf-Elder on a 1 1/2 ton White chassis. T&G No. 99 fit the bill, and the V&T purchased the car for $3,400. The car traveled from Tonopah to Carson City in the care of Assistant Master Mechanic Ed Peterson, who in 1910 had delivered the McKeen car to the V&T. Repainted in the V&T's yellow color scheme, the new car remained No. 99. Motorcars Nos. 23 and 99 operated on several runs, including Reno to Minden. Their last service was to Virginia City, which ended with the abandonment of that line in 1938. They were officially retired in 1941, and the body of No. 99 was sold to become part of a building in Virginia City. The body was saved by Graham Hardy, who gave it to the Nevada Heritage Association in 1964. Stored outdoors until 1978, little remained but the wooden framework. Transferred to the Nevada State Railroad Museum in 1980, and the subject of a full restoration feasibility study in 1983, the remaining body was demolished by a wind storm in 1985. The few remaining pieces are being preserved by the Railroad Museum.